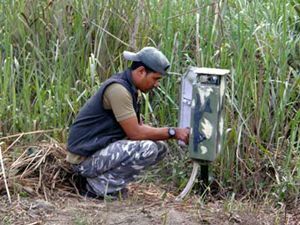 The project aims to protect Assam’s resident wild cat species through the formation of a multi-disciplinary project merging pioneering research, conservation awareness, and training. The forest of Assam is home to six species of wild cat: jungle cat (Felis chaus), leopard cat (Prionailurus bengalensis), Asiatic golden cat (Catopuma temmincki), marbled cat (Pardofelis marmorata), fishing cat (Prionailurus viverrinus) and the clouded leopard (Neofelis nebulosa). These species are all currently threatened and two of them are listed on the 2008 IUCN Red Data List as Vulnerable. This is a national flagship project focusing on the clouded leopard to draw international attention to the conservation of Assam’s wild cats and their forest environment. With accurate information regarding the ecological requirements of these felids, it will enable the development of effective conservation strategies to help ensure the survival of these species. The investigators aim to answer such questions as: at what density are these animals found, how much space does a viable population require, what is the status and distribution of these cats in Assam, and how does habitat alteration affect clouded leopards and the other sympatric small cats? They will undertake, conduct, and oversee presence/absence surveys of clouded leopard by networking with local wildlife officials and other experts, and the results will form the basis of a detailed population distribution map. These surveys will also collect distribution data on other sympatric cat species, and will aid evaluation of their status. 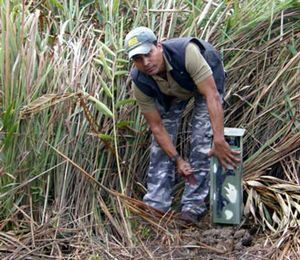 These data will be used to produce a conservation plan, which will be distributed free of charge to wildlife managers and other interested parties throughout Assam and the rest of Northeast India. In addition they will provide conservation research training to local communities and improve awareness of the wild cats by running education workshops for local schools and communities. They will also conduct questionnaire surveys in the villages surrounding wildlife reserve and sanctuaries to assess the potential level of hunting/trade of this species and its prey base. Simultaneously, they will investigate the possible role of the clouded leopard in enhancing environmental awareness in the area and as a flagship species for wildlife conservation as a whole. To study the status, distribution, and ecology of the wild cats of Assam, India, with a focus on the clouded leopard. Using a combination of camera trapping, radio telemetry, and carnivore sign survey, the investigators will conduct the first intensive field study of the wild cats in the area. Studying the clouded leopard’s ecology will provide insight into the cat’s predatory behavior, its diet and feeding habits, ratios between clouded leopards and their prey, and the clouded leopard’s choice of habitat. To study the population dynamics of the wild cats in general and clouded leopards in particular. This research will provide information on the size and density of populations and population dynamics such as survival rates, reproduction, animal movements, and dispersal pattern of the cats. To increase awareness of the Assam’s wild cats and their conservation needs, using the clouded leopard as a flagship species. Wild cat specific education materials will be produced and educational posters will be displayed at major tourist areas in the area. To train local communities and interested persons in a range of ecological field techniques. Training in mammal field research techniques including animal trapping and handling, the use of camera trapping and radio tracking equipment and associated data analysis techniques will be carried out. To investigate threats to the wild cats from hunting and trade. Questionnaire surveys throughout the towns and villages surrounding the different wildlife reserves and sanctuaries will be conducted. This will also provide an insight into local people’s views and knowledge of Assam’s felids.